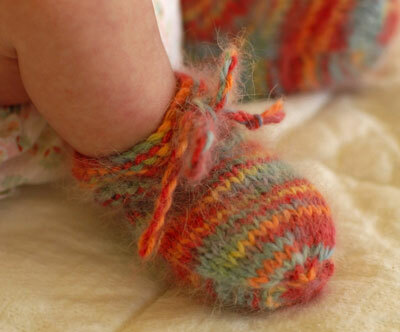 These adorable booties make a great baby shower gift. 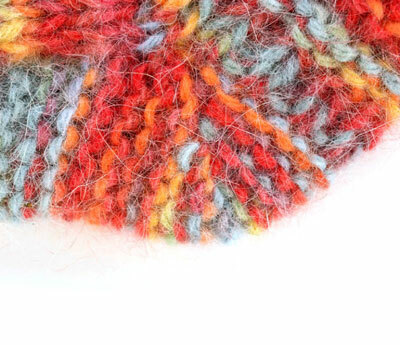 They knit up quickly in worsted weight yarn on two needles. The sizing information is included here, but you can adjust size by changing needle size or yarn thickness. Row 1: * K1, p1 *, rep from * to * to end of row. Begin with the cuff and leg. CO 32 sts, leaving a 6-inch tail. Eyelet Row: * K1, yo, k2tog *, repeat from * to * to last 2 sts, k2. Work 4 rows 1 x 1 rib. Next Row: K 8, place these sts on a holder, k16, place last 8 sts on holder. Work the instep and upper toe. Work back and forth on center 16 sts in St st until instep measures 2 inches from split. Next Row: * K2tog *, rep from * to * to end of row. 8 sts rem. Next Row: * P2tog *, rep from * to * to end of row. 4 sts rem. 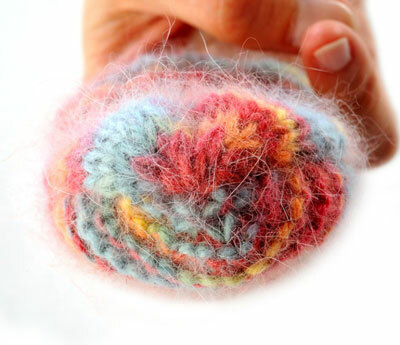 Cut yarn, leaving an 8-inch tail, and place these 4 sts on a holder. Work the short-row heel and lower foot. Place 8 sts from each holder onto one needle, with RS facing, so that back of heel is at center. Join yarn, leaving an 8-inch tail. Row 1: K 15, wrap the next st and turn. Row 2: K 14, wrap the next st and turn. Row 3: K to 1 before previously wrapped st, wrap the next st and turn. Row 4: K to 1 before previously wrapped st, wrap the next st and turn. Repeat rows 3 and 4 until 6 sts rem unworked in center of heel. Row 1: K to wrapped st. Pick up wrap, work together with st. Wrap the next st and turn. Row 2: K to wrapped st. Pick up wrap, work together with st. Wrap the next st and turn. Row 3: K to double-wrapped st. Pick up two wraps, work both together with st. Wrap the next st and turn. Row 4: K to double-wrapped st. Pick up two wraps, work both together with st. Wrap the next st and turn. Repeat rows 3 and 4 until you have worked all heel sts. Work even in Garter st on these 16 sts until sole measures same length as instep (2 inches from end of heel). Next Row: * K2tog *, rep from * to * to end of row. Next Row: * P2tog *, rep from * to * to end of row. Cut yarn, leaving a 4-inch tail. 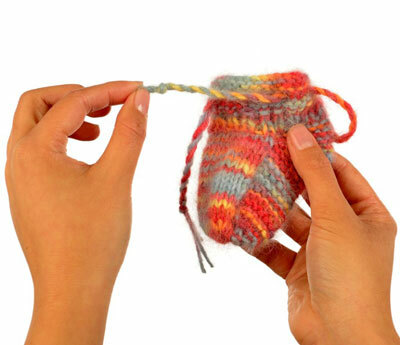 Now you finish the booties and make a twisted cord. Sew back seam using 6-inch tail from cast-on. Sew one side of foot using 8-inch tail from heel join. Sew second side of foot using 8-inch tail from end of sole. Place 4 sts from instep toe onto a needle. 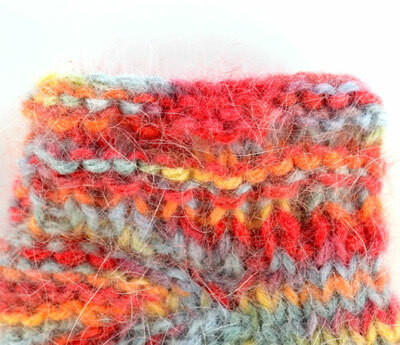 Thread 4-inch tail onto tapestry needle and thread needle through 8 toe sts. Pull tight and bring tail to inside. Cut two lengths of yarn, 72 inches each. For one cord, fold one length in half. Holding one end of the folded length securely, twist yarn at other end in one direction until strand is tightly twisted (a). Fold this twisted strand in half, allowing the two halves to twist around each other (b). Knot halves together at each end. Repeat steps 2–5 for other cord. Thread twisted cord through eyelet loops of bootie, then tie securely in a bow.